The E2-TR is a fully automatic, multi-color ribbon hot stamping machine that can run at speeds of up to 7,200 impressions per hour. 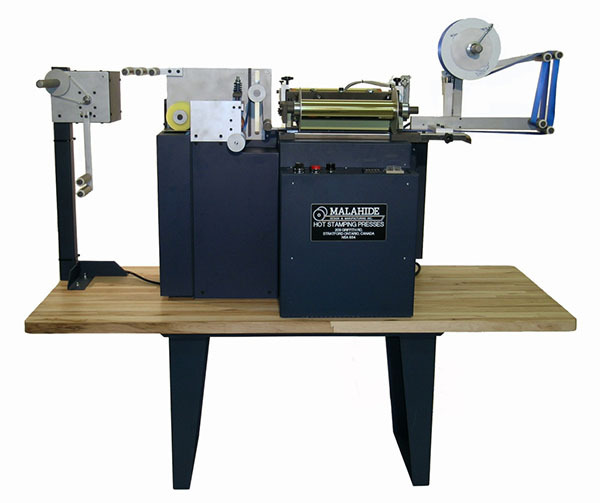 This ribbon hot stamping system can feed multiple rolls of different colored foil simultaneously, allowing the system to hot stamp multiple colors of foil in one pass. The most common uses of the E2-TR Ribbon Hot Stamping Machine are for hot stamping award ribbons, gift and packaging ribbon, rosette components and tapes. Ribbon printers are able to customize their E2-TR Ribbon Hot Stamping Machines with a variety of available upgrades that we designed to further enhance production abilities. With the ribbon rewinder upgrade, the ribbon hot stamping machine can automatically re-roll printed ribbon onto a spool, saving our clients time and money. The base model ribbon hot stamping machine runs at 3,600 ribbon impressions an hour, but with the speed upgrade, the E2-TR can run at a top speed of 7,200 impressions per hour. For a complete list of upgrade options and detailed information on the E2-TR Ribbon Hot Stamping Machine components, please visit the E2-TR Ribbon Hot Stamping Resource Page. For more generalized information about hot stamping dies, artwork and foils, visit the Hot Stamping Applications Page. For more information on how Spartanics can provide a hot stamping solution for your specific needs, please contact us by filling out our ‘Contact Form’ or call us today +1 (847)394-5700.